Type: SOFTWARE. Detail: Openings 1 d4. Product Code: CBFT-bOTLVWDVD. 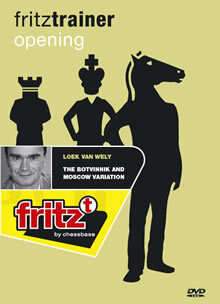 In this DVD, Dutch top grandmaster Loek Van Wely presents both the Botvinnik Variation and the Moscow Variation of the Slav Defence, two extraordinary opening systems excelling by extreme sharpness and complexity. The Botvinnik Variation 1.d4 d5 2.c4 c6 3.Nc3 Nf6 4.Nf3 e6 5.Bg5 dxc4 6.e4 b5 7.e5 h6 8.Bh4 g5 9.Nxg5 hxg5 10.Bxg5 Nbd7 11.exf6 Bb7 12.g3 c5 13.d5 (D44) which leads to tactically explosive positions beyond any routine, has been played on highest level with the black pieces by Kasparov, Shirov and Kramnik. Van Wely explains the ideas of this system mainly by means of his own white games, supplemented by games of Ivanchuk, Piket and Bacrot. Also in the Moscow Variation, tactical complications are always on the agenda. The introductory moves 1.d4 d5 2.c4 c6 3.Nc3 Nf6 4.Nf3 e6 5.Bg5 h6 6.Bh4 dxc4 7.e4 g5 8.Bg3 b5 (D43) result in a dynamic position which the sixtimes Dutch champion employs in practice both with Black and White. All in all, the DVD is a fascinating reflection of modern, tactical, dynamic chess. Even players who dont intend to adopt the mentioned systems in their own practice (but who knows?) will doubtlessly extend their chess understanding by Van Welys presentation. Video playing time: 5 h 30 min. Nimzo-Indian: Move by Move. Emms, J. $29.95.